The stag god is one of the few early animal spirits for whom we have a name — Herne the Hunter - Cernunnos — the Horned One — or Lord of all Stags. He is especially associated with the lordship of horned and hoofed animals, and with the wild hunt in which spirits of the dead were carried to the otherworld. The hunter identified with the stag — this is a very ancient mystery: Hunter and hunted are one. Horned animals, especially stags were associated with male sexuality. 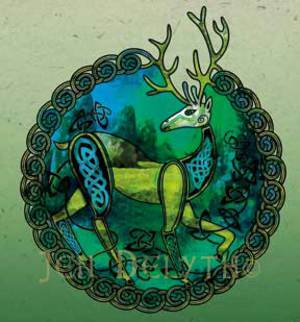 To the Celts, the stag symbolized wild nature. His alertness, speed, aggression and potency during the rutting season made him an object of reverence, his spreading, tree-like antlers seemed to epitomize the forest. Stags are associated with shape-changing and appear throughout celtic mythology as supernatural beings. In the Tale of Culhwch and Olwen, the Stag of Rhedynfre is able to speak to Arthur's man Gwrhyr, Interpreter of Tongues. In the Mabinogi, a stag is the agent through which Pwyll and Arawn meet. In the "vita merlini" Merlin transforms into lord of the animals. Stag artwork is collaged with photograph of Carnac menhirs, Brittany.